Every year I take Jared-David to see Santa and every year it is becoming more difficult to find a Santa who isn't fully booked. Since when did they decide you need to book to see him anyway?! When I was a little girl I stood in line and waited my mum paid £2 I got a picture and a toy and I was over the moon. As times have changed I thought I would make a list for the people of West Yorkshire so they could see where Santa will be and dates, times and prices. Ackworth Garden Centre - Opens on the 12th November at 2pm and will be there until 2:30pm Christmas Eve there are a full list of dates and times in the link. Prices are not stated on the website, it does get busy so you could be waiting for a while. Pontefract at Voctoria Garden Centre - They offer a few options when it comes to meeting Santa, Breakfast with Santa and Tea with Santa as well as the Grotto. You can book online for any of the events in the past they have had limited available Grotto slots to purchase in-store. 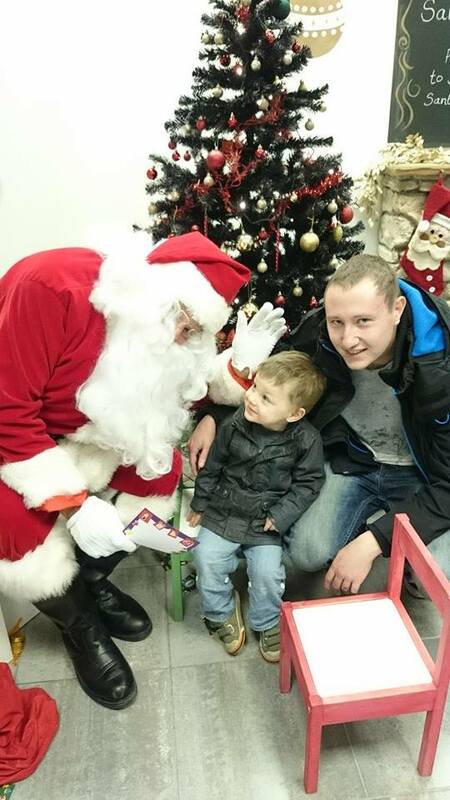 The Grotto opens on the 20th of November and the cost is £7.50 per child with a maximum of 2 accompanying adults, the prices includes the visit and a gift for the child. Carr Gate Garden Centre - Opens on the 12th of November it's book on the day only in store for the opening 12pm until 6pm. They recommend booking online for all other days, this is £8 per child and all children must be accompanied by an adult. The Grotto is open for weekends only during November then it's open daily from the 3rd December until the 23rd December. I have had a look online and people have already started booking the days so I would get in quick if you are planning on visiting here. Wakefield at Hampsons Plantworld - The grand opening is 19th and 20th of November where Santa will arrive by Horse and cart at 10:30am there will be free mince pies and mulled wine also as well as other fun for the family. They will be open 11-4 every weekend so that is from the 19th of November until the 24th of December. The cost is £7.50 per child and each child receives a gift when I spoke to Santa he told me that even the babies get gifts which is great. Bradford at Tong garden centre - Opens on the 12th November you must book online the charge is £12.50 and adults have to pay £2.50 which they then get back to spend in the garden centre. I personally think this one is a bit too expensive and I do not agree with the adult having to pay. The child gets to see Santa and will get a gift. Keighley & Worth Valley Railway - Runs from on the following weekends, 26/27 Nov, 3/4 Dec there are another two weekends but these are fully booked. This isn't just a visit to Santa it's a super special visit where you get to ride the train which I think makes it more magical. It is £17 per adult and child over the age of 3 toddlers 6mnths-36mnths are £8.50 under 6months go free. I think the price is fantastic considering it's a day out to meet Santa rather than just 10 minuet visit. MIddleton Railway - This is very similar to the above but is a cheaper option. These run on the following dates and can be either pre booked or purchased on the day but I would advise pre booking, 3/4 Dec 10/11 Dec 17/18 Dec and the 23/24 Dec. Booking is essential for the 24th of December. The cost of this is £8.75 per Adult £11.75 per child aged 3-12 and £7.75 for under 3's, children under 12 can travel for free if they do not require a gift from Santa. Totties garden centre in Holmfirth - There are selected dates that Santa will be visiting so please do check the website and you need to call to book your slot. It is £5 per child and each child will get given a little gift. If you just want to have a look at the Grotto you can have a look for free from the 3rd of December. They also give 10% of to the Forget Me Knot Trust. National Coal Mining Museum - This is amazing I'm so excited about this one. Santa arrives at the museum on 26th of November and is there every weekend until the 23rd of December. I'm sure under 5s normally can't go under ground but they can to visit Santa. Booking is essential and you will need to call them to book, the number is on the website. This is a really good priced visit Adults £5 Child £6.50, each child will get a certificate and a gift. They have a lot of Christmas events coming as well so I would definitely have a look on their website. Marion Centre in Leeds - Opens on the 19th Nov. There are a lot of dates on the website so take a look. Now there are a few options you can see Santa for FREE but the child won't get a gift, £3 for a gift, £5 for a photo, or £7 for a gift and photo. All the money raised will go to their chosen charity which is candlelighters. There are so many more that I could add to the list such as Eureka in Halifax, but the list would just go on and on. If you have any recommendations then please feel free to leave them in the comments or if you have an experience of any of the above then I would love to hear them.